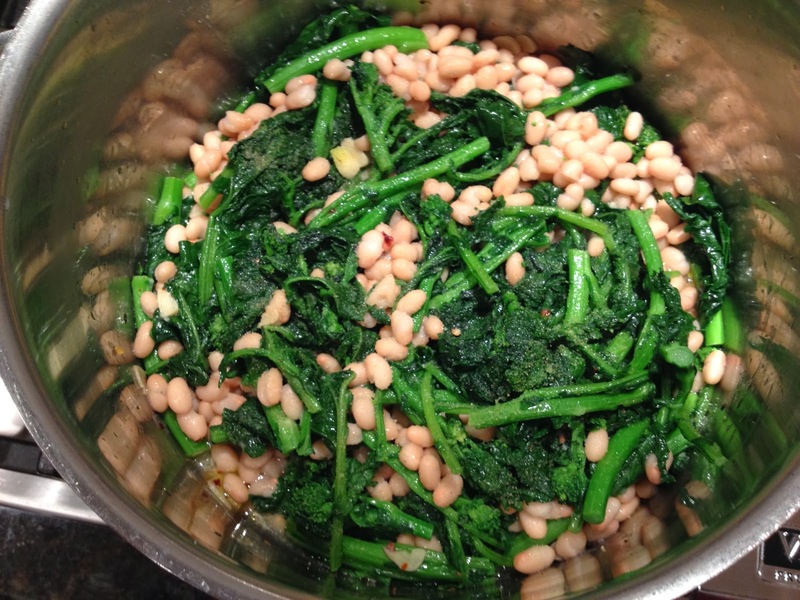 I’m asked all the time: “How do you make your broccoli rabe?” “What about vegetarian dishes?” Since you asked, I’ve decided to devote an article to a few of these delicious side dishes, or “contorni“. However, with a wedge of cheese, a crusty loaf of bread and a glass or two of wine, you can easily convert these to a satisfying vegetarian entree. 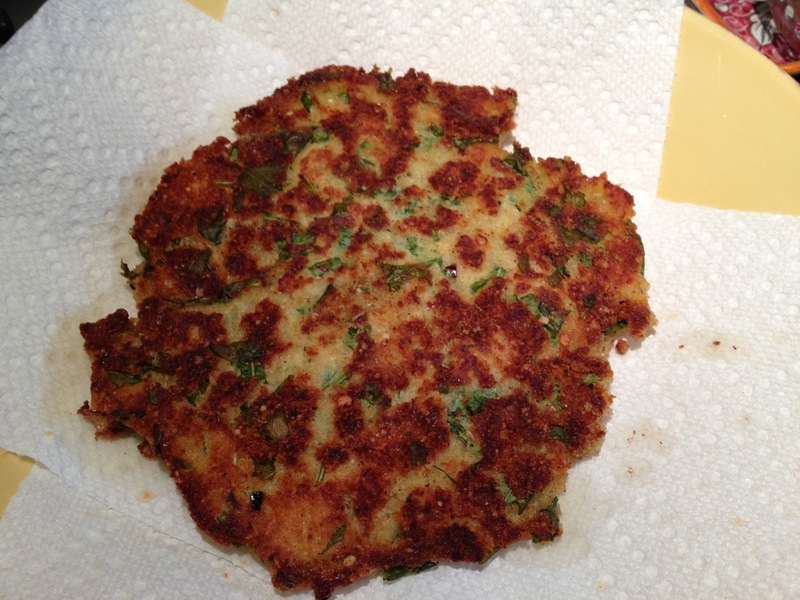 I normally make this with leftover egg and breadcrumbs after frying chicken cutlets, however you can easily make these savory fritters by themselves. In a large bowl, beat the eggs, season to taste with salt & pepper, red pepper, and garlic powder. Add the diced arugula and stir in. Slowly add bread crumbs and stir until the entire mixture comes together. It should be soft and pliable, but not sticky. Fry in a few tablespoons of olive oil. Press the fritter flat with a spatula as it cooks. This will make 4 side dish servings. With or without white beans, I probably make this at least once per week. Boil a large pot of water, 4-6 quarts will suffice. 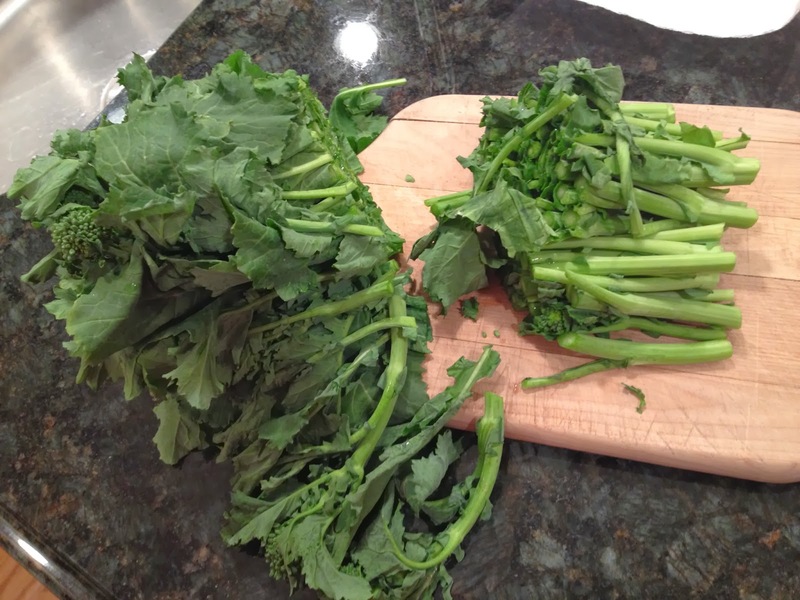 Trim the rough ends from the broccoli rabe and then chop the broccoli rabe in half. Once the water boils, drop the stems in first, and the leaves in 30 seconds later. Blanche for 2-3 minutes. No more! Here’s what they’ll look like when you drain them to a colander. 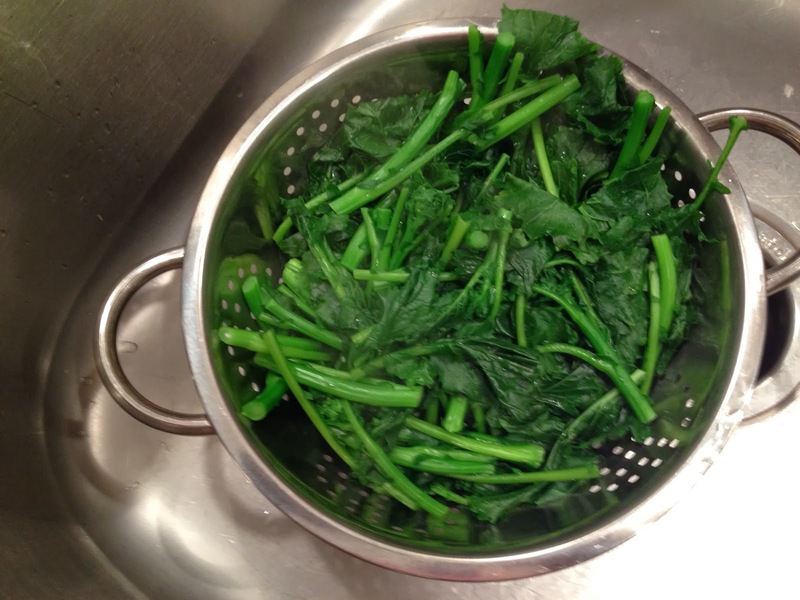 While the Rabe drains, add oil to the pot that formerly held the broccoli rabe. Saute the garlic with salt, pepper, and crushed red pepper just until the garlic starts to soften. Then remove from the heat, add the broccoli rabe and toss through. At this point, you can eat it like this, or you can add a can of white beans. If using the beans, add them now, toss them through and leave the pot on the stove uncovered. The longer it marinates the better it will taste. Do not cover it! This could easily be a vegetarian entree and unlike the two recipes above, is a bit more work. Though none of it is hard. In a food processor combine 2 anchovy fillets, one handful of arugula, one handful of parsley, three garlic cloves, 1/2 of a sweet onion, 1 celery stalk, 1/2 cup of Parmigiano cheese, salt, pepper, and a drizzle of olive oil. Pulse until it forms a loose pesto and remove to a large mixing bowl. 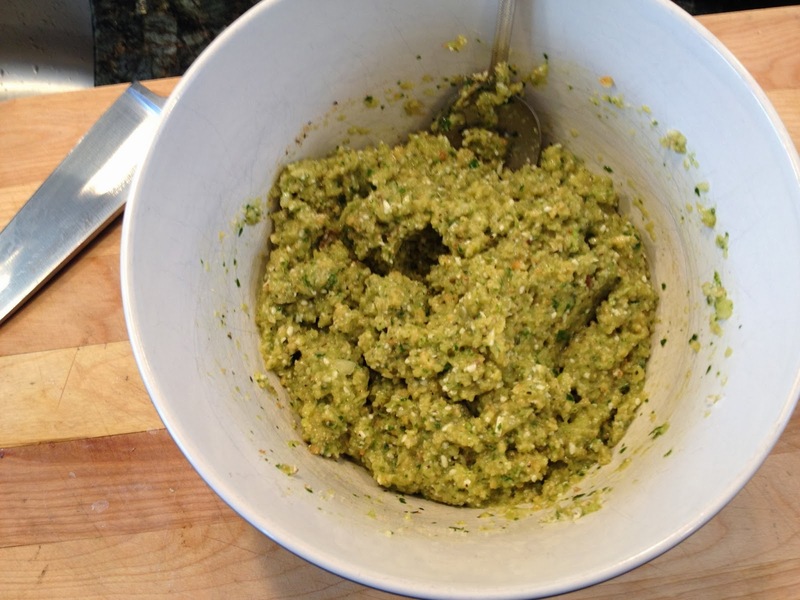 Next, crack 2 eggs into the pesto and combine with seasoned panko bread crumbs until a “wet stuffing” forms. Once it comes together, you can cover & refrigerate it for a few hours, so you can easily make this ahead. 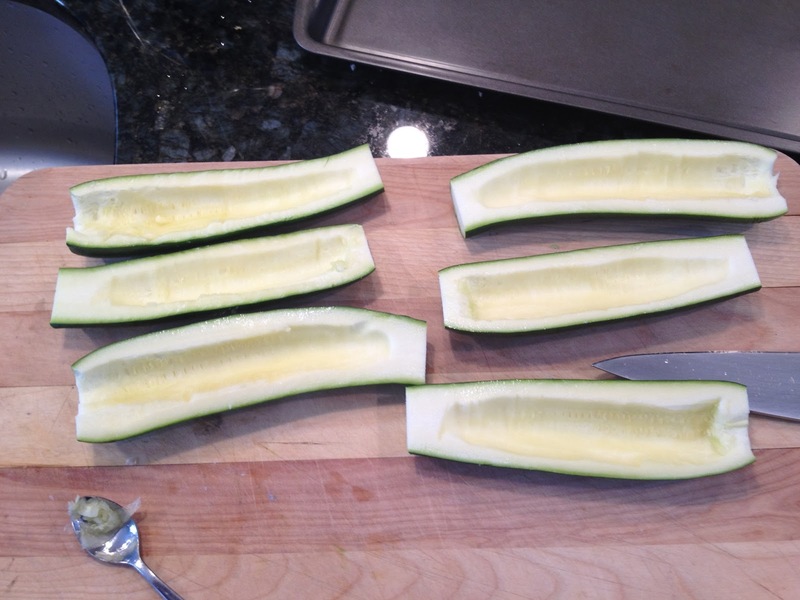 While the stuffing is resting, halve the zucchini lengthwise and scoop the seeds out with a teaspoon. This will form a “canoe” for the stuffing. Lightly salt the zucchini and then stuff them with the filling. Set your over to 350 and bake for 20-25 minutes. Before baking, drizzle the stuffing with some extra virgin olive oil and sprinkle some parmigiano on each boat. 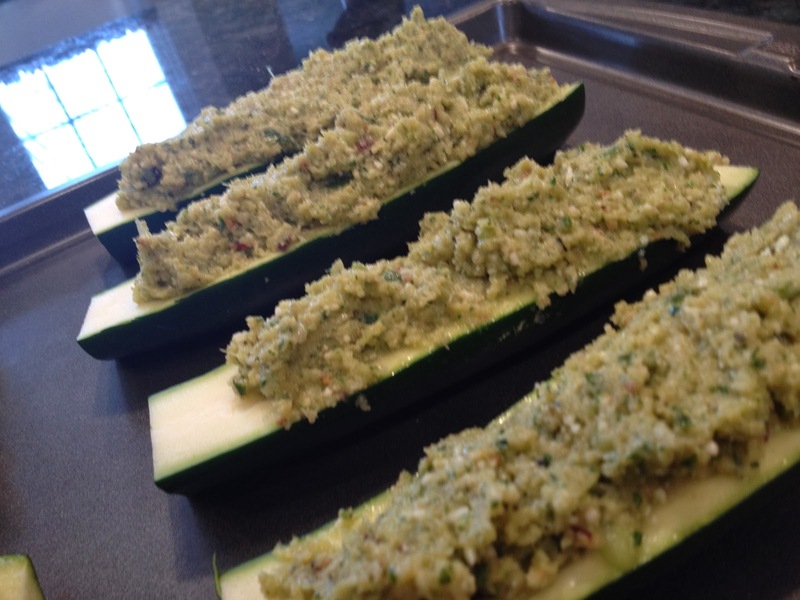 The zucchini will be cooked but still firm and the stuffing will form a nice crust.